Passover has been past for a while. At this point many [meat-eaters] who observed it are still breathing a big sigh of relief every time they sink their teeth into a piece of bread. The hankering for brisket from the first seders, however, can also linger for a while after the holiday. Whenever I cook brisket I make a lot, and have leftovers for days. Yet I’m always bereft when the last of it is gone: I’m kind of an addict. Thankfully, I found a recipe in The Complete American Jewish Cookbook for a prune-sweet potato tzimmes made with brisket. It’s far simpler and faster than a full-on brisket, but still yields tender, flavorful meat. 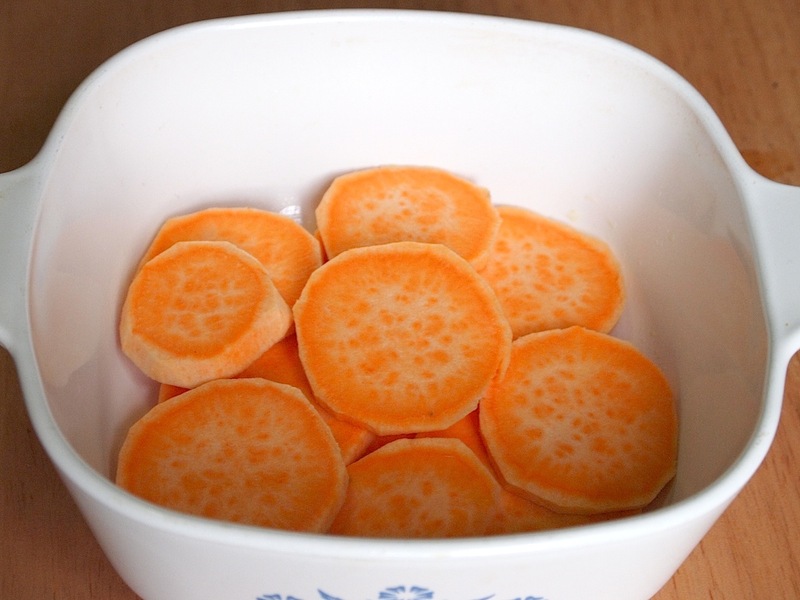 Tzimmes, for those of you who did not immediately leap to read the Wiki article linked above, is a traditional Eastern European Jewish sweet veggie dish. It’s usually made with things like carrots and turnips; in fact, I never knew one could have a meat tzimmes until I found several in the book from which I took this one. I made a major edit to this dish to bring it out of “holiday land” and into the everyday: I quartered the original recipe and used flank steak instead of real brisket. This let me get just over a half pound of meat and make “tzimmes for two” – the biggest problem making brisket on a weeknight is less the cut itself, and more that it comes in massive chunks which take ages to braise. Using a smaller piece of meat halves cooking time, and the cooking methods here (already intended for a tough cut) break the flank steak down to tender falling-apart-ness. See, this recipe pretty much assumes you’re hanging out in a shtetl (or possible the Lower East Side) where meat is scarce and you don’t have fancy pans. Hence, this beef is not treated gently: to begin with you pretty much toss it in a pan with prunes and boil the crap out of it. Old world cooking techniques aside, the addition of sweet potatoes to this dish bring a distinctly New World twist. They line the casserole in which the beef is cooked after its time on the stovetop. 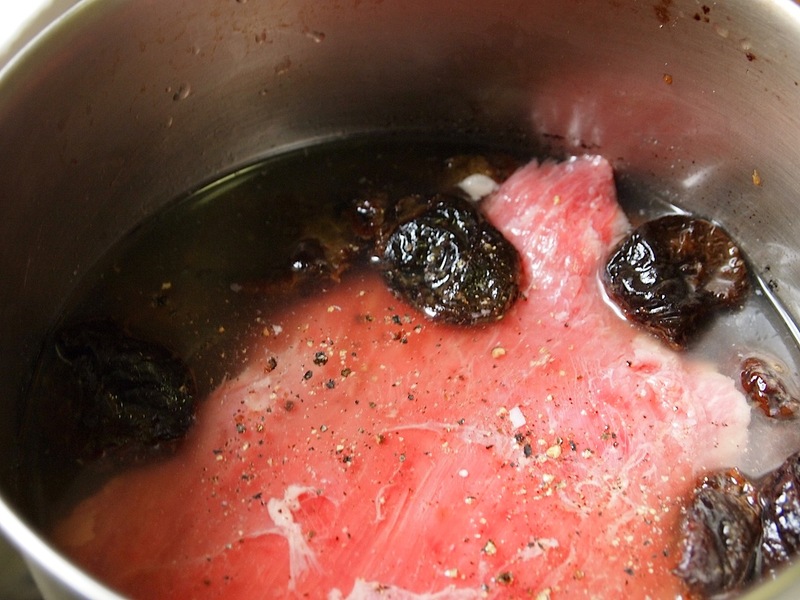 Flat-out boiling meat might seem inelegant to a cuisine mindset steeped in French techniques (a traditional braise starts with searing before liquid is added), but the beef and prunes yield a rich, brown gravy. This gets poured over the sweet potatoes in preparation for oven time. The meat is added to the casserole, covered in sauce, and dotted with brown sugar. Another divergence from French technique: where Gallic tradition dictates acid be added in the initial liquid cooking stage, here lemon juice is tossed in just before putting the meat in the oven for second cooking phase. 1. 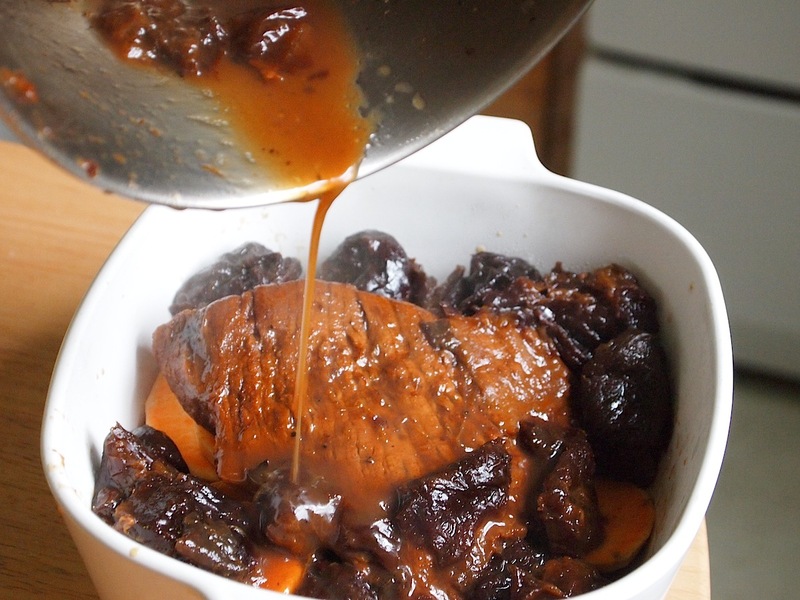 Combine prunes and meat in a heavy-bottomed saucepan, and add water just to cover. Season with salt and pepper, and simmer over low heat until the meat is nearly tender (up to 90 minutes). 2. While the meat is cooking, peel the potatoes, slice them thinly, and use them to line the bottom of a casserole or Dutch oven just big enough to fit the cut of beef. Use all the potatoes, making as many layers as necessary. Preheat the oven to 350 degrees. 3. Remove the meat from the gravy and place it on top of the potatoes in the casserole. 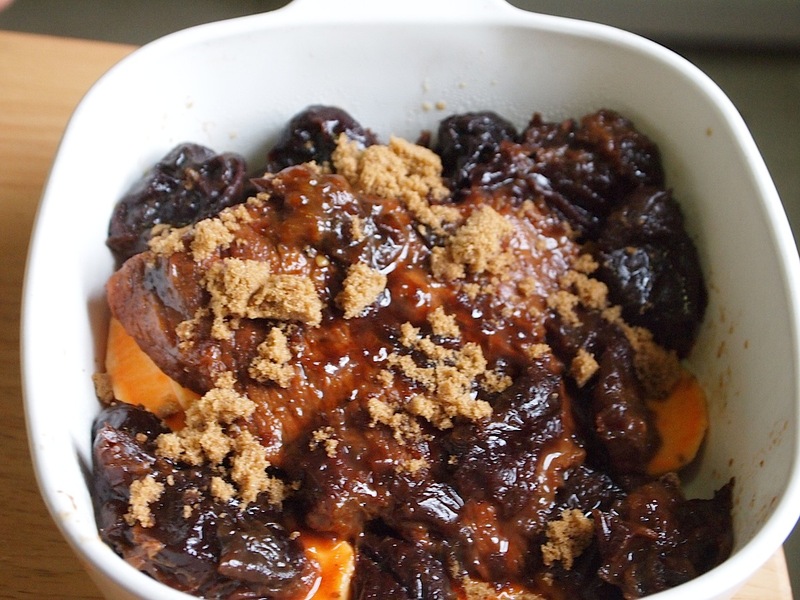 Pour the prunes and gravy over, and sprinkle the sugar and lemon juice on top. 4. Cover and bake about 40 minutes, until the potatoes are cooked and the meat is tender and browned. Serve hot, sprinkled with herbs. **I’m setting out the full recipe here. To make this a faster, two-person dish: use a half pound of flank steak, quarter the rest of the ingredients, and boil the meat for only 30 minutes. Oh man. This looks so good. I’m with you, fighting with a brisket on a ‘school night’ is just too much of a hassle. This is a great way to get an awesome dish without all the trouble. Thanks so much for sharing. This sounds an awful lot like the brisket a friend of the family cooks each year for Passover, though hers doesn’t have sweet potatoes (which sounds like an awesome addition, actually). I love fruit-and-meat stews, no matter what cuisine they come from, so this dish is right up my alley. Love the idea of scaling it down to turn it into a weeknight-friendly recipe, too. Will have to remember this the next time a craving for brisket strikes! Yum – I love prunes in savory dishes. 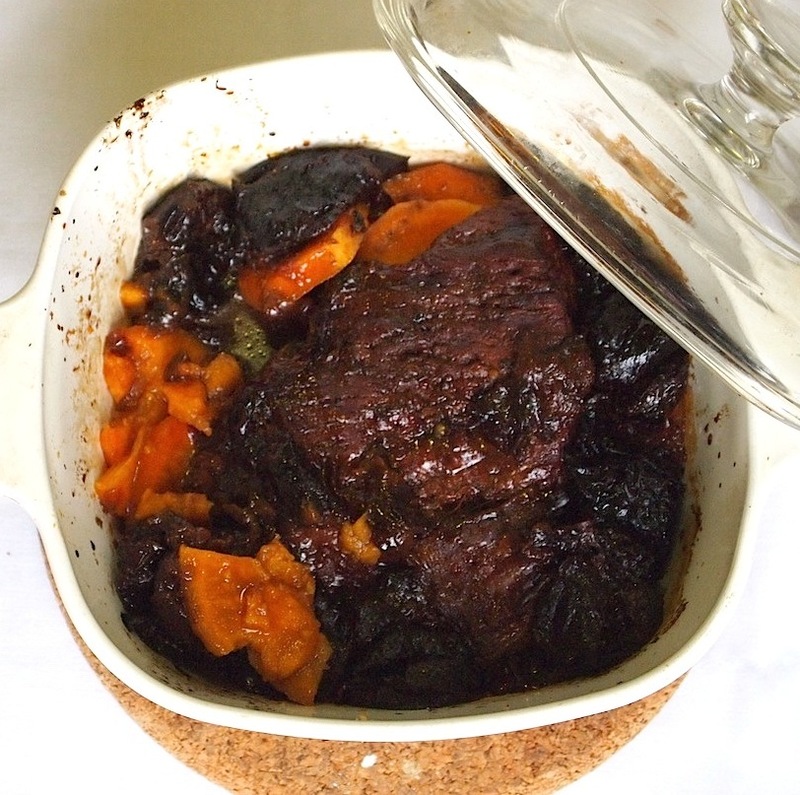 The combination of brisket, prunes and sweet potato sounds great! How interesting..love this idea! Nicely done! Brisket is something I’ve always wanted to try, but have yet to do due to fear of the unkown. This recipe looks great. I am a big fan of adding fruit to meat – lamb and dates anyone? – so this looks a winner. Hi Celia! YUM! Adding prunes is new to me, and I love it! Look at the meat…gorgeous and looks so savory! But I actually like to eat the sweet potatoes on the bottom. Must be soooo good….! I love brisket any time of the year but we always plow through our leftovers so fast. I think I’ll have to make it again soon just to try this recipe! I have a brisket in my freezer right now… this is a perfect (and different way) of doing it, can’t wait to try!